The push for more eco-friendly materials and more stringent vehicle engineering standards has led to a number of changes to manufacturer requirements for A/C compressor oils over the past two decades. Mineral oil was the de facto oil used up until the early 1990s thanks to its ability to mix with the R-12 refrigerant, but when R-12 was shelved due to its ozone-depleting properties, mineral oil had to be scrapped as well because of its inability to mix with the more environmentally sound R-134a. R-134a became the refrigerant of choice in U.S. mobile air conditioning systems in 1994. Its popularity coincided with the emergence of polyalkylene glycol (PAG) oil, which mixed well with the new refrigerant. However, because mineral oil and PAG oil are not to be mixed, another compressor oil was needed to bridge the gap. The solution was ester oil. With R-134a, there are primarily three different viscosities of PAG oil being used: PAG 46, which is the most popular viscosity oil; PAG 100, which is also common; and PAG 150, which is not often used, but it is still required for a certain compressor used in some GM vehicles from the ‘90s to the early 2000s. R-134a has dominated the U.S. market for roughly two decades, but it too is beginning to be eclipsed by a new refrigerant due to environmental concerns. While R-134a does not deplete the ozone like R-12, it has been shown to have notable global warming potential (GWP). For this reason, R-1234yf was developed for its cooling abilities and its low GWP. 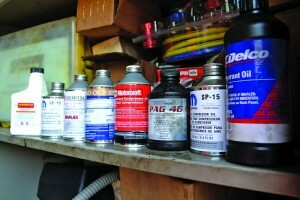 But just as the discontinuation of R-12 necessitated the use of certain ester and PAG oils, the introduction of R-1234yf has brought with it new requirements for compressor oils that techs need to be cognizant of since manufacturers are now requiring more varied and specific compressor oil formulations for the cars they build. The proprietary nature of these products has put the onus on shop owners and technicians to be stocked with, and ready to use, the wide array of oils on the market to accommodate whatever vehicle rolls into their shop. 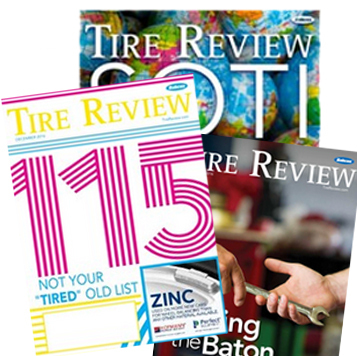 “When I go into shops — and I have a network of shops I routinely go into — most of their shelves in their parts rooms that have to do with A/C stuff seem to have up to 25 bottles of different refrigerant oils on the shelves because every vehicle manufacturer specifies a different oil for their particular system,” Schaeber said. 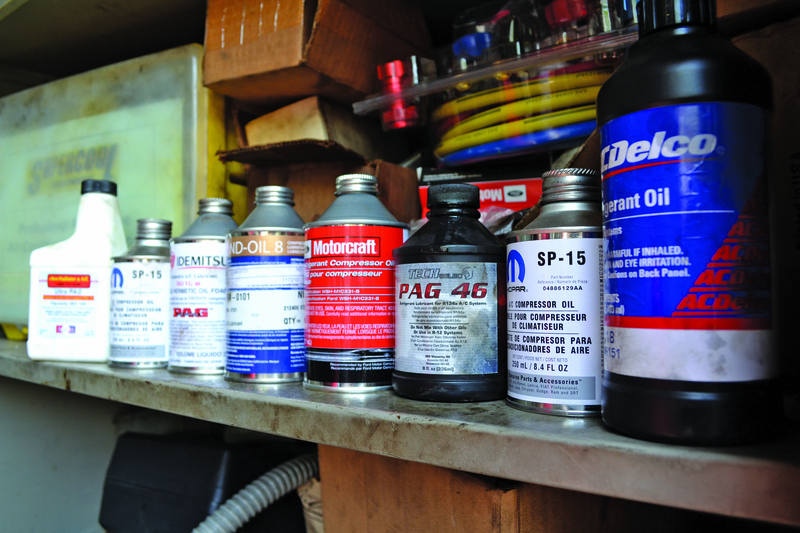 PAG oils might reign supreme in the hierarchy of today’s compressor oils, but that doesn’t mean there aren’t some very important exceptions to be mindful of. Polyalphaolefin (PAO) oil can be used as a replacement for some PAG oils, and is sometimes preferred because it doesn’t absorb moisture from the air like other oils do. For hybrid-electric vehicles that use electrically driven compressors, polyol ester (POE) oil is not just recommended, its use is mandatory in many cases. Using PAG oil in hybrids can be hazardous to the vehicle, but it can also endanger the technician since there is an electrocution risk associated with using the wrong oil. “I have heard horror stories where a technician put regular PAG oil into their hybrid vehicle, and they ended up having to have the A/C system replaced because Toyota, for instance, has a system where the check engine light will come on and the A/C system won’t run if the computer detects a certain amount of electrical connectivity within the case of the A/C compressor,” Schaeber said. A number of companies market oils labeled “universal” that purportedly can be used in any car (hybrids notwithstanding), and with both R-12 and R-134a refrigerants. With all the variations between compressor oils on the market, the one-size-fits-all utility of universal oils would seem to be a godsend for automotive technicians. But according to experts, the only thing universal about universal oils is the risk they pose to the vehicles they are used in. According to Schaeber, not following manufacturer recommendations is a recipe for disaster.